The city of Plzeň (Pilsen) is situated in Western Bohemia at the confluence of four rivers. With its 170,000 inhabitants it is the fourth largest city in the Czech Republic and an important industrial, commercial, and administrative centre. It is also the capital of the Pilsen Region. In addition, it has been elected the European Capital of Culture for 2015 by the Council of the European Union. 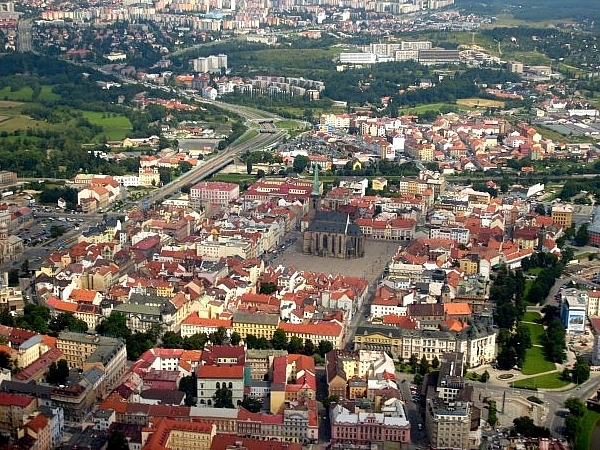 Aerial view of the centre of Plzeň from the south. Photo © M. Špelinová (photographer) & K. Ekštein (pilot), 2009. Plzeň is well-known for its brewing tradition. The trademark Pilsner-Urquell has a good reputation all over the world thanks to the traditional recipe, high quality hops and good groundwater. Beer lovers will also appreciate a visit to the Brewery Museum or the Brewery itself. Apart from its delicious beer, Plzeň hides lots of treasures in its core. The city can boast the second largest synagogue in Europe. The dominant of the old part of the city centre is definitely the 13th-century Gothic cathedral featuring the highest tower in Bohemia (102.34 m). It is possible to go up and admire the view of the city. Not far from the cathedral is the splendid Renaissance Town Hall from 1558 and plenty of pleasant cafes and pubs are situated on and around the main square. There is also the beautiful Pilsen Historical Underground – under the city centre, a complex network of passageways and cellars can be found. The passages are about 14 km long and visitors can see the most beautiful part of this labyrinth during the tour. It is recommended to visit the City Zoological Garden, having the second largest space for bears in Europe and keeping a few Komodo dragons, large lizards that exist only in a few zoos in the world. In the surroundings of the city, there are some worth seeing landmarks, especially the Radyně Castle, the Kozel Castle, and St. Peter's Rotunda in Starý Plzenec which comes from the 10th century. The University of West Bohemia in Plzeň provides a variety of courses for both Czech and international students. It is the only institution of higher education in this part of the country which prepares students for careers in engineering (electrical and mechanical), science (computer science, applied mathematics, physics, and mechanics), education (both primary and secondary), economics, philosophy, politics, archaeology, anthropology, foreign languages, law and public administration, art and design. Plzeň (Pilsen in English and German) is located in the middle of the West Bohemia region – rouhgly 100 kms (62 miles) south-west from the Czech capital, Prague (Praha). The city has access from the D5 motorway connecting Prague (Praha) with Germany (see/zoom the map above). Plzeň has very good bus and train connections with the capital of Prague (it takes about 1 – 1.5 hour to get from Prague to Pilsen). From the Prague International Airport (PRG) you can reach Pilsen by frequent public transport in 1.5 – 2 hours. Bus and train departures from Prague to Pilsen can be found at http://jizdnirady.idnes.cz/vlakyautobusy/spojeni/ (you can switch to the English version by pressing a button in the right lower corner of the input form). The arrival station in Pilsen is CAN (Centrální autobusové nádraží = Central Bus Station) and Plzeň – hlavní nádraží (Main Railway Station) respectively. From the airport take the local bus no. 100 to Zličín. Departures every 15-30 minutes. Tickets to be purchased from the machines in front of the departure. Take a Student Agency bus from Prague-Zličín to Pilsen bus terminal (Plzeň-CAN). In general, departures every hour. See the bus schedule at https://jizdenky.regiojet.cz/?0 Preferable to buy the ticket in advance. If you will stay at Ibis Hotel, take a taxi (approx. 300 Czk = ~ 12 Euro) or the trolley-bus no. 12 to Domažlická rondel stop. The hotel is close to it. You can find all public transport departures at http://jizdnirady.idnes.cz/plzen/zjr/. Information about fares in Pilsen public transport can be found at http://www.pmdp.eu/. Attention! You need to buy a ticket or to have a prepaid Pilsen Card in order to use the municipal public transportation system... The ticket inspectors are not pleasant people at all.